The kit eliminates any need for expensive advertising or hiring of designers. The kit allows anyone of any skill level, to effortlessly implement some of the most effective no-cost marketing strategies. The kit contains over 850 easy edit templates, that allow you to quickly create everything from social media graphics to printable signs and flyers. 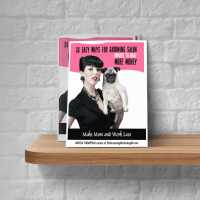 Includes quick start guides, instructions, and booklets that walk you through setting up a complete profit system for your grooming business in just minutes. The kit's 850+ easy edit templates allow you to instantly create beautiful, professional looking flyers, social media graphics and more. All with just a click of a mouse! No skills needed. Master the marketing of your business in just minutes instead of months. Eliminate any need to hire expensive designers or pay for costly advertising or software. Edit the kit's templates online, using the easy & free Google Slides point & click editor. The kit allows you to instantly put a strategic marketing system into place. It focuses on eliminating expensive paid advertising and replaces it with no-cost & low-cost methods that have been proven to work better! The kit contains profit program details and printable materials for dozens of profit increasing strategies. Allows you to easily increase your income without working harder. The Groomer's Profit Kit is set up as a three-part success system. It provides you with easy, inexpensive yet effective ways to bring in new customers, keeps them coming back and allows you to effortlessly make an additional profit on every groom. 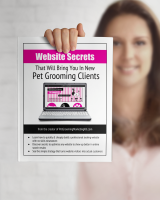 The Basic edition of the kit is an affordable option that provides you with a starter marketing kit that includes 36 different pdf printable marketing pieces to use in your grooming salon, the printable marketing planner, the 2019 printable Groomer's Appointment Book and 2 marketing secrets Ebooks. It comes as an instant digital download. 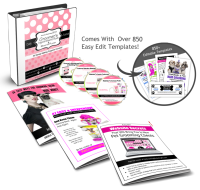 The Advanced edition of the Kit includes everything from the Basic kit PLUS over 850 editable templates, 3 Ebooks (plus social media marketing cheat sheets) and is available as an instant digital download. The Advanced edition of the kit is also available as 4 CD's with 2 binders and 3 booklets. It contains the same materials as in the digital download edition except it is shipped to you in physical format. Available for shipping within the U.S.A only.